Saturday was a revelation. 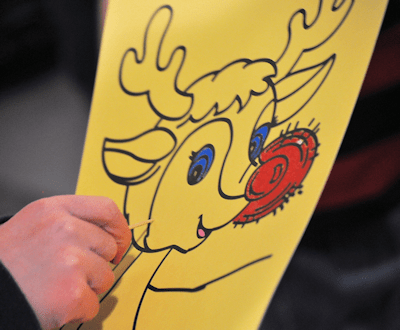 A group of parents run a special needs club at the weekends, with the support of a school and the grateful advice and help from the National Autistic Society. 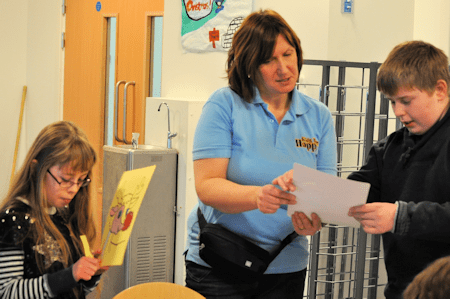 We borrow a school premises and open up to children with ANY type of disability up to the age of 14 in Aberdeen – not just those on the autistic spectrum. We also accept siblings, as there was nowhere that any of us could go with all our children to play, or be involved in activity sessions. The mix of excitement, christmas coming, a certain man in a red suit, and lots of sugary chocolate is not always a recipe for success, so I met the day with a certain feeling of elation and caution for how it might proceed. We are all volunteers and we don’t get paid. I think it is important to mention that up front, as there is sometimes confusion over how we all fit in to the structure. 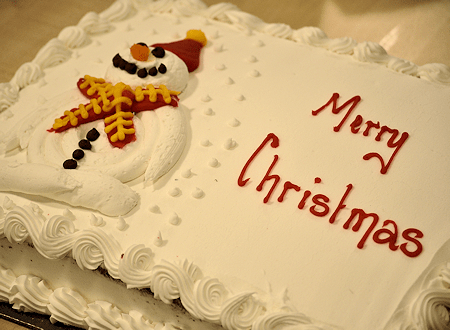 There was a lot of excitement last week because of the party, and arrangements had been in place for quite a while. 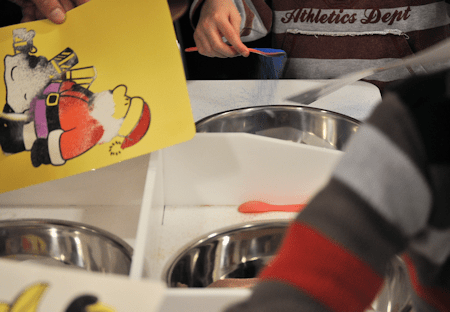 We received a lovely offer from Kids Bee Happy who provide parties using sand art to come along, which I eagerly accepted. The lovely Lorraine from Aberdeen arrived with a couple of tables and was soon in constant demand. Be very aware, that this is no mean feat to undertake for anyone, let alone a fledgling business. It takes a confident entertainer to enter a room with such a large proportion of special needs children. If your products don’t cut the mustard, you will hear about it very quickly from them. The sand art had generated a buzz of expectation, as it is a new childrens activity, both to me, and to the other parents from the group. We were all keen to see how it worked – and how our children would respond to it. It was fabulous. Children who usually have little or no interest in sitting still for long periods of time were concentrating and working on the projects. 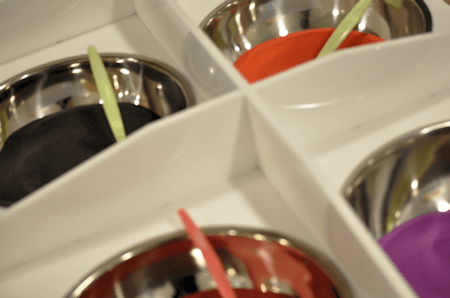 The tables are set up as a unit which contains 6 bowls of different coloured sand. All in all, there were 12 colours of sand that the children could choose from. The children (and many of the adults) chose from the racks of pictures that they would decorate with sand. This is a very hands on and engrossing task to get to grips with. With lots of pictures to choose from, age groups from 2.5 – 45 were kept amused. I even noticed one granny having lots of fun. To make the sand art, using a nail, or a little stick, the artist peels each section back on the picture one at a time. That opens up a section which is sticky. Little fingers then choose a colour of sand and carefully spoon it onto the picture. When the picture is shaken, the sand remains on the picture for a fabulous colour effect. It can take anything from about half an hour to 45 minutes to complete a whole picture. Our children did pieces of their pictures at a time, then laid their pictures aside and came back to them after eating, or running about. The fact that they could dip in and out throughout the party make it the perfect activity. Just watching the concentration on their faces was amazing. Some children did several pictures, and when they were finished making their creations, the pictures were laminated to take home as souveniers. 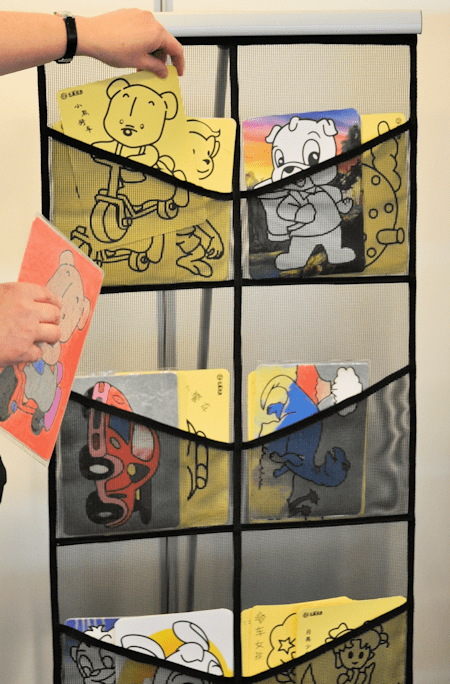 The finished and laminated pieces of art have a little hanging tab at the top. I think they would be perfect to add a little calendar to the bottom and give to relatives and friends as presents. 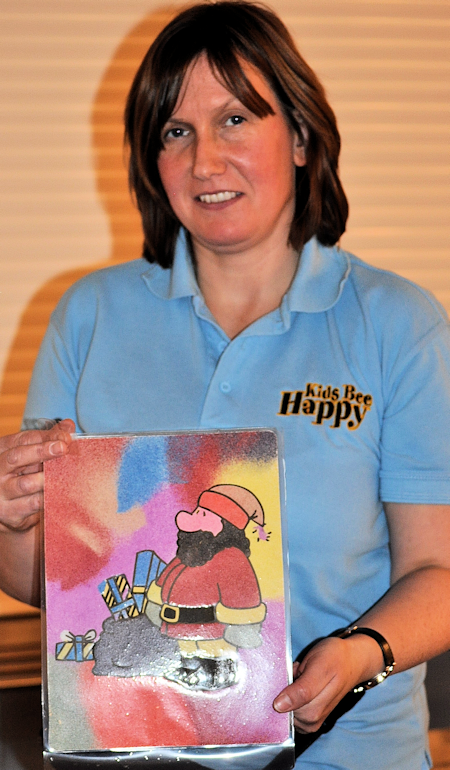 Lorraine liked this santa picture, as the child who did it used all different colours of sand for the background. 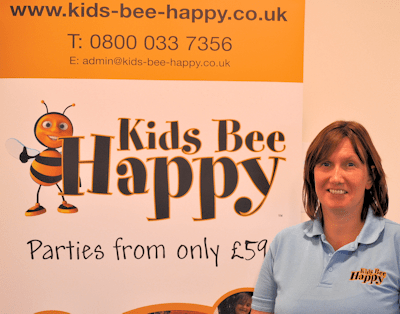 This is a new business for Lorraine in Aberdeen, and she was constantly in demand from parents, who were asking her for cards for future childrens parties and school functions. Everyone agreed that the sand art was a lovely and welcome surprise which would keep children entertained again and again and again. We really all recommend it for any function, school fete or party. For such a large group of special needs children – they did themselves proud. 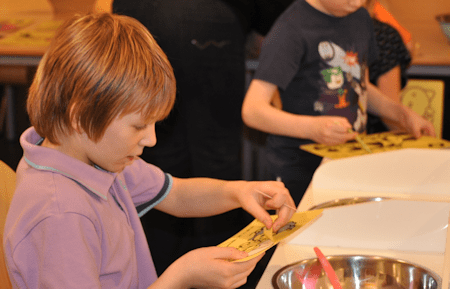 The concentration levels and interest was amazing, and many parents were delighted to see their children enjoying such a time consuming and high concentration requiring activity. Poor Lorraine was inundated and we over-ran terribly due to how much everyone was enjoying it. She certainly had to work very hard. We also provided a bouncy castle, plenty of food and the local magician, Garry Seagraves Magic. 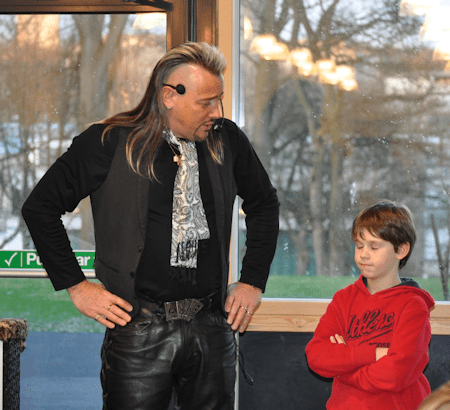 I had seen Garry work while I was in the oil industry at functions, and now, as a parent, I have seen several of his magic shows that are tailored towards children. 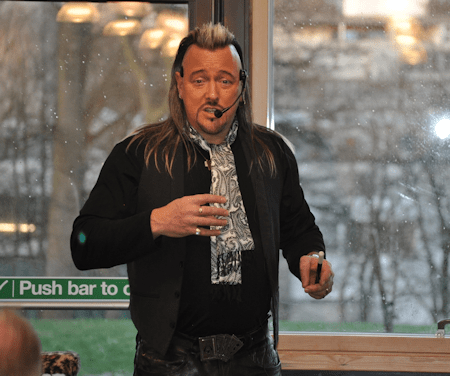 He also had experience of giving shows to special needs children – and with the trademark leather trousers, long hair and trusty rabbit Basil, the children all seem to gravitate towards him. He was the natural choice for our kids. I don’t think there are many parents of primary age children who have not seen one of his shows as he is quite the celebrity to local under 12’s. The red man arrived to hand out some presents, and photographer duties were sadly lacking as I managed to miss getting a picture of him – my excuse is that we had to sort out our pressie mishaps when some labels came adrift. All in all, it was a successful party. We over-ran and we owe a great deal of thanks to all the entertainers, volunteers, helpers and even the school janitor who never, ever complains about what we request of him for the club. He was not due to be in Aberdeen at the weekend and came all the way back to open up for us when our weekend cover janitor could not make it in. That’s dedication. Disclaimer: The parents of all children included in this post have given permission for their images to be used. Sand Art was provided by Kids Bee Happy, and was a most welcome addition to our party. It is one that we will definitely repeat in the future. « Thank you to Warner Bros. for the lovely Xmas Gift. Looks like you had a great christmas party. Cool pictures!!! Wow this looks great! How wonderful of you all to give up your time to organise such a brilliant event. I love the sand art! We either do things like this or we all sit at home with bored kids, so its an easy choice for all of us i think. Sand art really was amazing. Keep it in miind. 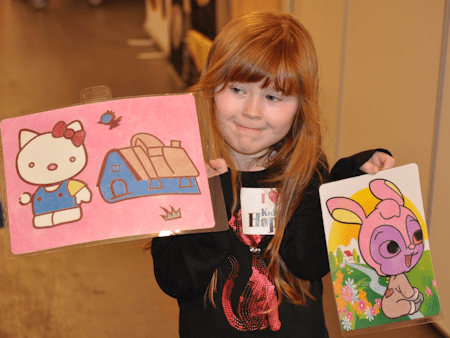 A brilliant afternoon, organized by wonderful people leads to VERY happy little bunnies. It is really nice when it all goes well and everyone enjoys it. The sand art was sooo great though. It was so good for them all. Sometimes having such a big group of highly mobile special needs children can be very hard work, but it seemed to be soo easy on Saturday. It was a lovely way to end the year for the club. Well done everyone. I think anyone that offers their free time to help with things like this deserves a round of applause. If everyone offered their time like this just once a year think of all the lovely things that could happen! I love coloured sand. The texture is amazing. We use it like glitter! For some of us, it is because we are parents ourselves with no club out there for our kids to go to, so it is do this, or have nothing our kids can access. There are some fabulous volunteers who turn up regularly just to help the kids. They are awesome. This was my first experience with the coloured sand. It was amazing. Sounds like a great party for all who went. Well done to you all for organizing the event and giving your children a party to remember. Sand art sounds like the new salt dough! The sand art was amazing Fiona. I saw kids that can’t sit still for 5 seconds sitting patiently spooning sand over these pictures. We all had a lovely day.